Whenever I run long (6 miles or more) on a day I have off from work, my go to post workout recovery meal is a peanut butter, banana and honey sandwich. For me, it is just the perfect post run meal. 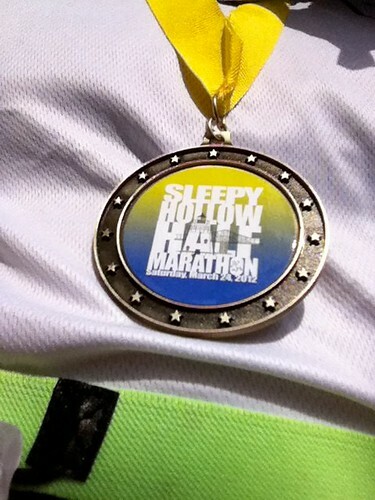 This past weekend, I put my winter base training to the test and ran the Sleepy Hollow Half Marathon. I ran my own race and took it at a nice and steady pace. 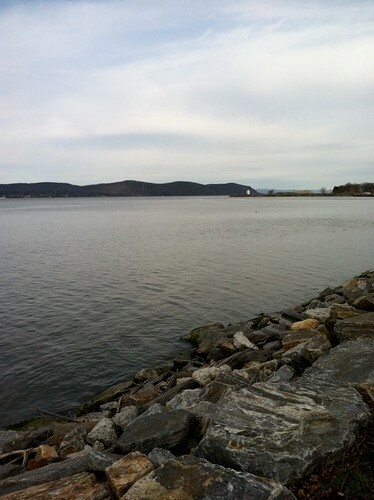 I ran alone, but did run into a friendly face along the way, which boosted my spirits. The course is packed with hills of all lengths and slopes. Running through some of those roads conjured up many memories from the times I used to run them with my running buddy. Finishing the race solidified two things for me. All those winter runs at 5:30am in the 30 degree darkness, fearing the hulk coyote (and other man eating animals) was stalking me in the bushes, paid off. And, I really wanted a peanut butter banana and honey sandwich or pancakes or a burger (the longer the run, the more food gets tacked onto the list…you should see my list after a marathon!). After the race, I made it home and de-grossified before I settled in to make breakfast (really lunch at this point). I had received my Joy the Baker cookbook a couple of weeks ago and was anxious to make something from it. 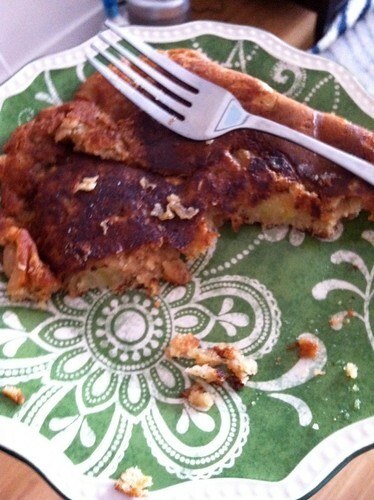 One recipe that did catch my eye was the Single Lady Pancake. A pancake recipe that made a single serving of pancakes. Intriguing. Then, when reading the recipe, she also lists a bunch of mix-in recommendations. The last one was to add peanut butter, bananas and honey. Sold! I apologize for the lack of pictures, I was super duper hungry and my brother was over also demanding food. So I did this on the super fly. Make your buttermilk if you don’t have any on hand. Since the ratio is 1 tablespoon of white vinegar for 1 cup of milk, for this recipe we would need 1/4 tablespoon of vinegar for 1/4 cup of milk (ignoring the 2 tablespoons for now). Since 3 teaspoons = 1 tablespoon, then 1/4 tablespoon would equal 3/4 teaspoon. So, in a measuring cup, pour in a very generous 3/4 teaspoon of vineger (3/4 teaspoon with an extra splash), then fill with whole milk to the 1/4 cup line and add the additional 2 tablespoons of milk. Let it sit for a couple of minutes while you do the next step. Whisk the flour, oats, sugar, baking powder, baking soda and sat in a small bowl. Whisk the oil, extract and buttermilk in another small bowl. Combine the wet into the dry, all at once, and stir to combine. Fold in the peanut butter, banana slices and honey. In a 10″ skillet or cast iron skillet (as recommended in the recipe) or griddle, heat up some oil (1-2 teaspoons). Here you have two choices. You can either make just one huge pancake (which you just pour all the batter in and smooth out with the back of your spatula to fill the pan) or you can make three smaller ones (just divide and drop three dollops of batter into the pan). After the edges look set and starting to brown and the batter itself is bubbly, flip the pancake(s). Cook until golden brown and your done! Since my brother was also here, I ended up doubling the recipe, and cooking it both ways. He had the three smaller ones, and I got the large one. As Joy mentioned, it is harder and messier to flip the larger pancake, but since I was the only one eating it, what did I care what it looked like right? Regardless, the pancake was still absolutely gorgeous to me (that’s love right there), and topped with some maple syrup, I was a happy camper. The pancake was light and fluffy and perfectly crisp on the edges. The peanut butter, bananas and honey hit the spot along with the additional sweetness from the maple syrup. I also made some bacon by draping bacon slices on a rack on top of a foil lined baking sheet and throwing it into a 400 degree oven for 20 minutes while I was making the pancakes (a method I much prefer now that I learned from The Amateur Gourmet). Perfect meal all around. In fact, after eating that monster pancake, I wanted more. Thank goodness this recipe only yields one pancake! The only picture taken after I finally slowed down enough to remember to take a picture! This entry was posted in Breakfast, Uncategorized and tagged bacon, Banana, Pancakes, Peanut butter. Bookmark the permalink. Sounds like the perfect breakfast, and I love how it’s just the right amount for one!